The Vertiv SmartRow infrastructure from Vertiv is a simplified, standardized and quickly deployable data center environment with significant CAPEX and OPEX savings over conventional designs. No other solution on the market provides such ease of deployment and integration. This complete data center infrastructure solution allows you to easily deploy and effectively manage an integrated IT infrastructure without being limited by building systems such as fire suppression and cooling. SmartRow is available in three- to six-rack configurations for up to 20kW of total capacity; and six-rack to ten-rack configurations for up to 36kW of total capacity. The solution allows the flexibility of starting small and expanding over time. 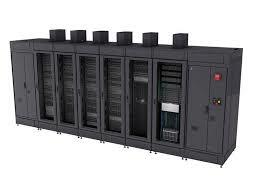 The SmartRow DCR is a self-contained, modular datacenter designed to simplify IT deployments in indoor spaces. With capacities up to 10 racks and integrated cooling, UPS, power distribution, fire suppression, backup ventilation and more. The SmartRow solution has a room neutral design that lets you avoid many of the significant costs that come with a conventional data center buildout.